Using KNORR Potato Flake gives a light, tender and moist texture to this burger bun. Matched with the rich meaty taste of Angus beef this is sure to be popular. In a small pot bring water to the boil. Once boiled remove from heat and pour in milk. Then whisk in the KNORR Potato Flakes GF until combined. Allow to stand for two minutes and then whisk again. Set aside to cool. In the bowl of a stand mixer fitted with the dough hook, add in the mash and all other ingredients. Stir until combined. Turn the mixer on medium low speed and knead until a soft yet tacky dough forms, about 5 minutes. Place the dough in a lightly greased bowl, cover, and let rise in a warm place for 1 hour, or until it's almost doubled. Turn the dough onto a lightly greased surface, gently deflate it, and divide it into 10 equal pieces. Roll each piece into a ball. Place the balls on oven tray, leaving about 4 to 5 centimetres between them and flatten gently. Cover and let rise until the buns have doubled in size 45 to 60 minutes. Towards the end of the rising time, preheat the oven to 175 degree Celsius. Bake the buns for 25 to 30 minutes, or until they're light golden brown. Remove them from the oven, and brush them with melted butter, if desired. Melt the butter in a large heavy skillet. Add the onions and cook while stirring frequently over medium heat for 5 to 6 minutes, or until tender. Add beer and the sugar, and cook until beer is absorbed and the onions become lightly browned, about 15 minutes. In a large bowl, gently but thoroughly combine the beef, KNORR Professional Garlic Puree, onion, beer, COLMAN'S Dijon Mustard, salt and pepper. Form into 10 patties, and place on the grill, turning heat down to medium. Grill them for 4-6 minutes per side, or until nearly the desired doneness. Top each burger with cheese, and heat till slightly melted. Serve on toasted buns and top each with the beer-braised onions. 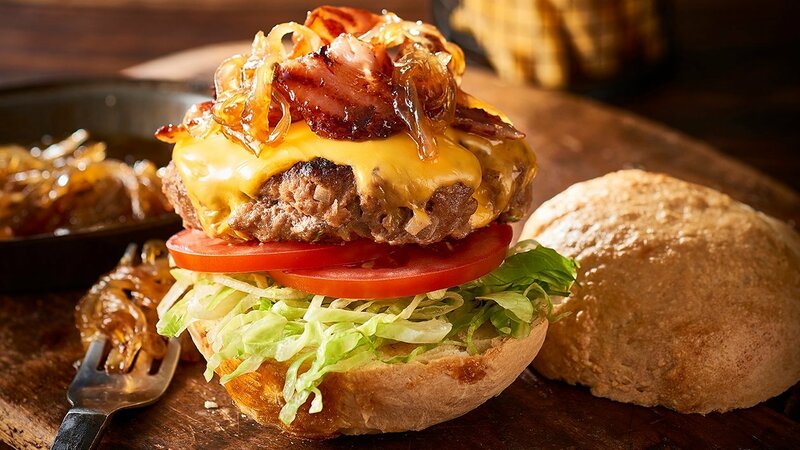 Take the base of the bun and add KNORR American Chipotle BBQ Sauce GFand HELLMANN'S Real Mayonnaise followed by the lettuce, tomato, patty with cheese, the maple bacon and finish with the braised onions.